Technical ceramic is a highly developed, high strength ceramic material that is primarily used in applications where high strength and toughness are required. These include electrical & electronics and automotive industries. Technical ceramics are also known as high-performance ceramics. They possess high bending strength, compression strength, and tensile strength. In terms of material, the technical ceramics market has been bifurcated into oxide ceramics and non-oxide ceramics. The oxide ceramics segment comprises alumina ceramics, titanium ceramics, zirconium ceramics, and others (including magnesium oxide and sintered fused silica), while non-oxide ceramics segment consists of alumina nitride, silica nitride, silica carbide, and others (including boron carbide and silicon aluminum oxynitride). The alumina ceramics sub-segment of the oxide ceramic segment is likely to remain highly lucrative during the forecast period, owing to its better properties compared to other materials. Its properties include high strength & hardness, temperature stability, and high wear resistance & corrosion resistance at high temperature. Based on product, the global technical ceramics market has been divided into monolithic ceramics, ceramic matrix composites, ceramic coatings, and others (including multilayer ceramics and advanced coatings). The monolithic ceramics segment accounted for major share of the market in 2018. The segment is anticipated to expand at a rapid pace, owing to its better physical properties vis-à-vis other products. Its properties include high dimensional stability, high strength, durability, flexibility, and toughness. Based on application, the global technical ceramics market has been segregated into electrical & electronics, medical, automotive, energy & power, and others (including chemical products and consumer goods). The electrical & electronics segment accounted for leading share of the global technical ceramics market in 2018, as technical ceramics are widely used in the electronics sector, owing to their characteristics and physical properties. These properties include porosity, bending strength, compression strength, tensile strength, stress intensity factor, and Weibull modulus. Based on region, the global technical ceramics market has been classified into North America, Europe, Asia Pacific, Middle East & Africa, and Latin America. 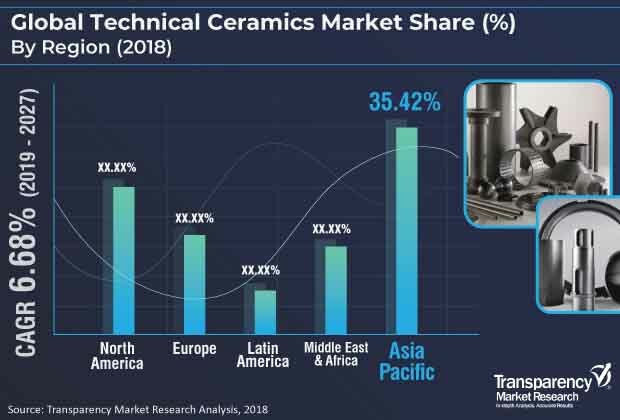 In terms of volume and value, Asia Pacific dominated the global technical ceramics market in 2018. The region is likely to remain highly lucrative during the forecast period, due to rapid industrialization and rise in demand for technical ceramics in electronics and automotive industries in the region. China is a rapidly expanding country of the market in Asia Pacific, owing to expansion in industries such as automobile, medical, and electronics in the country. Europe also constituted key share of the global technical ceramics market in 2018. The region contributes significantly to the technical ceramics market, due to the presence of large numbers of automobile and aerospace companies. The technical ceramics market in North America is expected to expand at a minimal pace during the forecast period, due to the sluggish growth of industries such as automotive and electronics in the region. Drivers of the technical ceramics market in North America include high demand for these ceramics in wind energy, medical implants, and aerospace sectors. The market in Latin America is estimated to expand at a high pace by the end of the forecast period, as the automotive and energy & power sector in the region has been expanding at a significant pace. Key players operating in the global technical ceramics market include 3M, Morgan Advanced Materials, CeramTec, Kyocera Corporation, Saint-Gobain Ceramic Materials, NGK Spark Plug Co., Ltd., Imerys Ceramics, Superior Technical Ceramics, Rauschert GmbH, McDanel Advanced Ceramic Technologies, Dyson Technical Ceramics, and CoorsTek Inc. In terms of material, the technical ceramics market has been bifurcated into oxide ceramics and non-oxide ceramics. The oxide ceramics segment comprises alumina ceramics, titanium ceramics, zirconium ceramics, and others (including magnesium oxide and sintered fused silica) while the non-oxide ceramics segment consists of alumina nitride, silica nitride, silica carbide, and others (including boron carbide and silicon aluminum oxynitride). Oxide ceramics was a highly attractive segment of the global technical ceramics market in 2018. The segment is expected to remain highly lucrative during the forecast period due the easy availability and low production cost of oxide ceramics. Based on product, the global technical ceramics market has been divided into monolithic ceramics, ceramic matrix composites, ceramic coatings, and others (including multilayer ceramics and advanced coatings). Monolithic ceramics was a highly attractive segment of the global technical ceramics market in 2018. The segment is anticipated to remain highly lucrative during the forecast period due to the rise in demand in the medical sector for the manufacture of medical devices and dental ceramics. Based on application, the global technical ceramics market has been classified into electrical & electronics, medical, automotive, energy & power, and others (including chemical products and consumer goods). The electrical & electronics segment accounted for major share of the global technical ceramics market in 2018, led by the rise in demand for these ceramics in wireless infrastructure, semiconductor equipment, and military industries. Based on region, the global technical ceramics market has been split into North America, Europe, Asia Pacific, Latin America, and Middle East & Africa. Asia Pacific is a key region accounting for significant share of the global technical ceramics market. The technical ceramics market in the region is projected to expand at a rapid pace during the forecast period, due to the rise in demand for technical ceramics in the electrical & electronics industry, primarily in developing economies of China and Japan. Technological advancements, such as penetration of composites in various applications in South Korea and Japan, have also boosted the technical ceramics market in Asia Pacific. The technical ceramics market in North America is anticipated to expand at a minimal pace during the forecast period, due to the sluggish growth of industries such as automotive and electronics in the region. Currently, the technical ceramics market in the Middle East is in the growth stage of the lifecycle; it is not estimated to saturate in the near future. However, as the market progresses, a continuous shift is expected in marketing and distribution activities. As the market witnesses increasing competition alongside the rise of the substitutes, suppliers would need to seek innovative ways to sustain market conditions. The report analyzes and forecasts the technical ceramics market at the global and regional levels. The market has been projected in terms of volume (kilo tons) and value (US$ Bn) from 2019 to 2027. The study includes drivers and restraints of the global technical ceramics market. It also covers the expected impact of these drivers and restraints on the demand for technical ceramics during the forecast period. The report also highlights growth opportunities for the technical ceramics market at the global and regional levels. The report comprises detailed value chain analysis, which provides a comprehensive view of the global technical ceramics market. Porter’s Five Forces model for the technical ceramics market has also been included to help understand the competition landscape of the market. The study encompasses market attractiveness analysis, wherein material, product, and application segments have been benchmarked based on their market size, growth rate, and general attractiveness. The study provides a decisive view of the global technical ceramics market by segmenting it in terms of material, product, application, and region. These segments have been analyzed based on the present and future trends. Regional segmentation includes the current and future demand for technical ceramics in North America, Europe, Asia Pacific, Latin America, and Middle East & Africa. The report also covers individual material, product, and application segments of the market in every region. The study includes profiles of major companies operating in the global technical ceramics market. The global market is dominated by large-sized players. Key players in the market include 3M, CeramTec, Morgan Advanced Materials, and Saint-Gobain Ceramic Materials. Market players have been profiled in terms of company overview, business strategies, and recent developments. The report provides the estimated market size (in terms of value and volume) of the global technical ceramics market for the base year 2018 and forecast for the period from 2019 to 2027. The market size and forecast for each segment have been provided for the global and regional markets.